This is a traditional snack which my mom often prepares at home. I love this murukku especially for it's slight sweet taste. This is very easy and quick to prepare. 1. Mix all the ingredients except coconut milk. 3. Use single star plate in the murukku maker to press the murukku. 4. Heat, oil in a pan. 5. 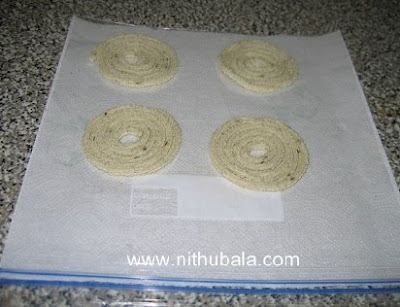 Press murukku in a oil greased sheet. 5. Depending on your wok size, put two or three murukkus at a time in oil. 6. Fry till crisp on medium flame. Drain excess oil on a kitchen towel. 7. Store in air-tight container. Note: Add extra water if coconut milk is not enough for dough but take care about the consistency of the dough. It should be soft like chapathi dough. Cute Murukku..Never tried this version !!! Waiting for my vacation to get the Murukku press !!! I love the murukku made out of coconut milk..this look perfectly good nithu. my fav snack. i too made it last week. looks so good. feel like grabbing some now. wow, that is innovative. Lovely and crunchy looking muruku. This coconut milk murukku is new to me.Looks very crispy and delicious. Yum...! wat a delicious snack. Very impressed with your presentation. Prefect looking crispy murukkus tempts me a lot..
Wow !!! look at them. They look lovely. I hope they tasted like Manaparai murukku. i luv murukus and these looks crisp and yum ! an award is waiting for u on my blog dear..
We have never tried this version; thankyou for sharing this recipe. Have added it to 'must try' list! adding coconut milk is new to me. Nithu, you have made the murukkus in perfect round shapes, they r so cute.. 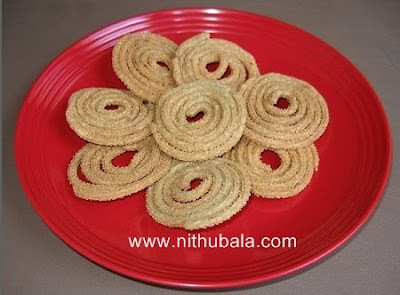 The Murukku looks very similar to chakri we make with rice flour but your recipe is quite different. Saw your Hindu post on this murukku. I made this and also blogged about it on the blog. Thanks for the recipe. Loved the outcome and it was very crispy and tasty!